Lok Sabha Elections 2019: Like LK Advani, Murli Manohar Joshi Joshi is deeply resentful of the manner in which he was told by the BJP that he would not be fielded this time. Murli Manohar Joshi has not been included in the list of campaigners in UP in the Lok Sabha elections. BJP veteran Murli Manohar Joshi has declared in a message to voters in his Kanpur constituency in Uttar Pradesh that he had been told by his party not to contest the national election. The 85-year-old is the latest BJP doyen to be benched after LK Advani from next month's contest. With the party holding up its 75-plus ban, it is the end of the road for another seasoned politician. Mr Joshi has been more active than his peers. He headed the Estimates Committee that, the opposition Congress pointed out, had been critical of the government's defence spend and also rising Non Performing Assets of state-run banks. Like Mr Advani, Mr Joshi is also deeply resentful of the manner in which he was pink-slipped by his party. When BJP general secretary Ramlal delivered the message and asked Mr Joshi to announce he would not contest, he refused. Sources say Mr Joshi said if such a decision had been taken, the least that party chief (Amit Shah) could have done was to convey it to him. 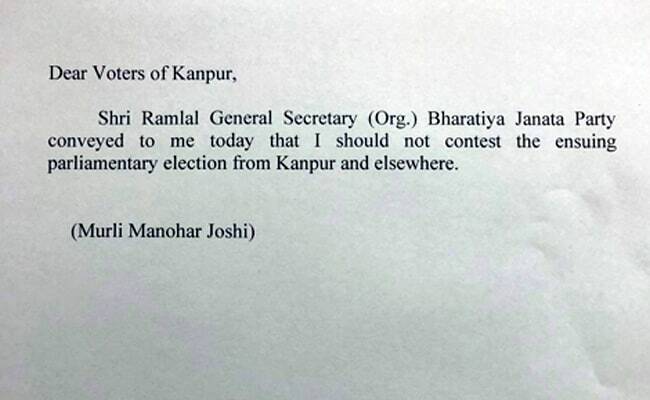 Mr Joshi's message on Monday, addressed to his constituency, read: "Dear voters of Kanpur, Shri Ramlal General Secretary (Org), Bharatiya Janata Party conveyed to me today that I should not contest the ensuing parliamentary election from Kanpur and elsewhere." Lok Sabha Elections 2019: Murli Manohar Joshi wrote a letter to the voters of Kanpur. Mr Joshi, who has been a union minister and a BJP president, has also not been included in the list of campaigners in Uttar Pradesh. In the 2014 election, Mr Joshi had given up his Varanasi seat for Prime Minister Narendra Modi and moved to Kanpur, where he won by a huge margin. Mr Joshi received the news much like his contemporaries did, according to sources. Mr Ramlal has been the bearer of grim tidings for all old-timers. Mr Advani, Kalraj Mishra, Shanta Kumar and Kariya Munda were informed by Mr Ramlal that they would not contest this time. Shanta Kumar and Kariya Munda, also former Union Ministers, were reportedly told on the phone. They were all told to announce that they were opting out of the polls. Mr Advani refused but all the others did. Mr Advani, who was India's first Deputy Prime Minister, is also hurt, say sources, that Amit Shah did not come and inform him of the party's decision. Amit Shah will contest his Gandhinagar seat this time. Mr Advani and Mr Joshi, both founder members of the BJP, were denied any post after the party came to power in 2014 and sent to a five-member Margdarshak Mandal or group of mentors, along with former prime minister Atal Bihari Vajpayee. The group never met in the past five years. Now the two leaders will not be seen in the Lok Sabha for the first time in decades.